In November I received an interesting book from Elizabeth Simmonds. It was four inches square, and I had never seen the structure before. I wrote to Liz and asked her about it. She told me that she had learned it from Anne Cowie, who made these as smaller books. I made a few models of the book. Three models of a modular accordion book structure based on a book I received from Elizabeth Simmonds in November 2018. Elizabeth learned the structure from Anne Cowie. One of the attractive features of this structure is that it is modular; that is, you can add as many pages as you like and each element is only two pages, so that if you make a mistake on a book page, you can simply cut another piece of paper and re-do that two-page spread. Here are some I things learned in making those models. The book consists of three categories of parts: the folios, the page wrappers, and the removable spine. The folios are standard folios: a piece of paper folded in half vertically. The page wrappers are the same width as the folios but double the height. Like the folio, they are folded in half vertically. But they are also folded horizontally twice: once 1/4 of the height from the top, and once 1/4 of the height from the bottom, so that the central vertical division of the page is equal to the height of the folios and the top and bottom division fold around the folio to meet in the back. Folio and two wrappers, not yet assembled. One folio and 2 page wrappers, mostly put together. The folios and page wrappers are then assembled in a daisy chain, ad infinitum (theoretically). Folios and page wrappers daisy-chained together. 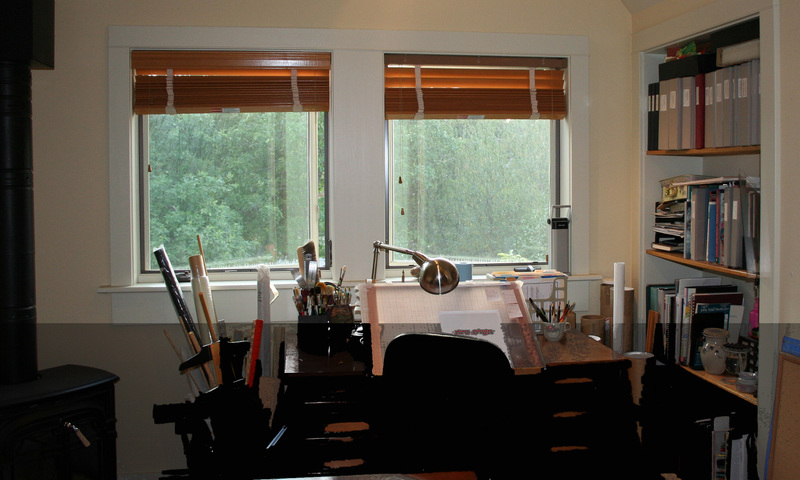 A five-inch-square may be the largest optimal size but this depends on the materials used. The optimal length of the book, 8 to 20 pages. (That’s 4 to 10 folios and 4 and 10 page wrappers.) Any less and the structure isn’t apparent; any more and the book becomes chunky. 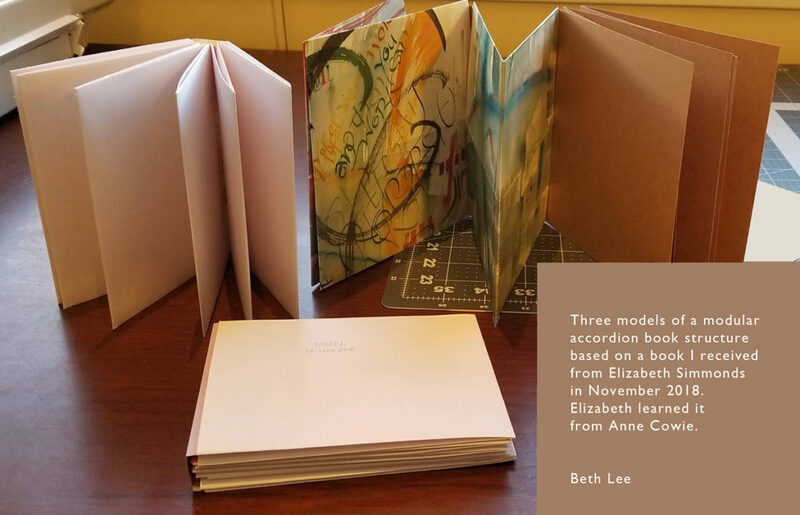 In Elizabeth’s four-inch-square book, the folios were made of card stock, the page wrappers of Arches Text Wove, and the spine of a card-weight paper. 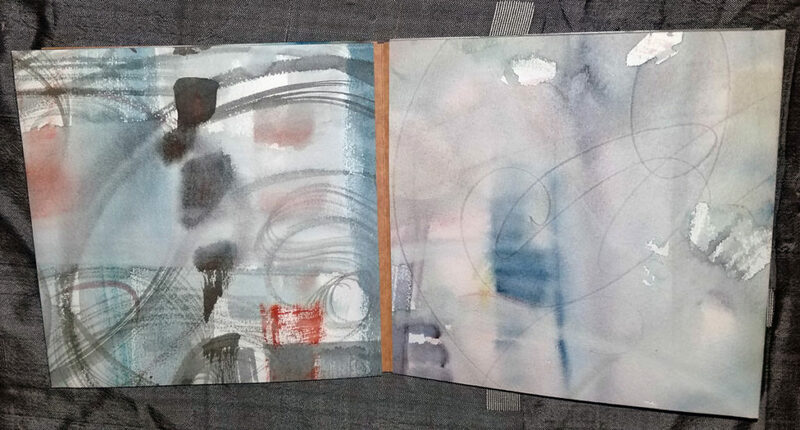 In choosing your materials, the folios should be heavier and stiffer than the page wrappers..
A small sliver of the folios will be revealed in the gutter area (at the center fold of each page opening), which can be a nice feature. If you don’t like that reveal, you can trim width the folio pages later. An assembled folio and 2 page wrappers. The gutter shows the folio. After (you think) you’re done, you can add a removable spine to make it more of a codex structure. You can see one in the top photo. I’m thinking I’ll add a board insert in the front and back to the first and last pages more “cover”-like. Since it’s all non-adhesive, if you add more pages, you can simply move the board insert to the new last page.